Just like a spider web. 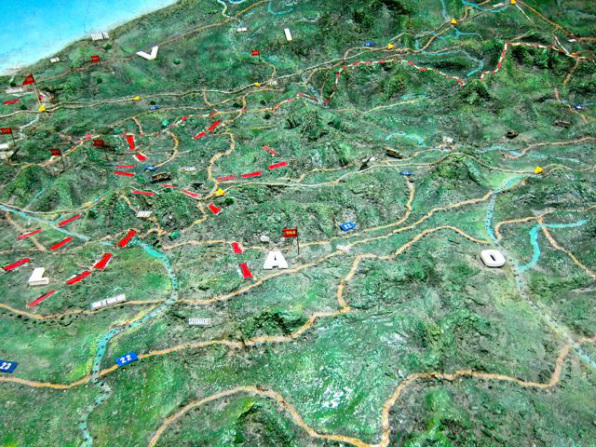 That was our first thought when we saw the display and video of the Ho Chi Minh Trail or what the Vietnamese refer to as the Duong Truong Son or Truong Son Road after the Annamese range of mountains in the Central Highlands of Vietnam. The Ho Chi Minh Trail Museum which is about 16 km. from Hanoi tells the story in a most graphic way. 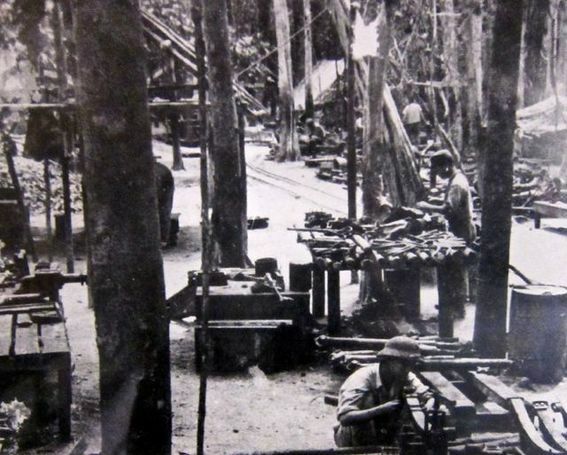 With not much help from modern construction equipment and mainly through sheer human effort and dogged determination, the Vietnamese National Liberation Front (NLF) army worked on old footpaths and transformed these into a 16000 kilometres (9,940 miles) of supply trail. How do you supply an army in the South when you could not control the air or the sea? Jungle, rivers, mountains, rain deluge and washout...the worst possible land, but where they could hide movement. That is the trail. From south of Hanoi to just 20 km from Saigon. 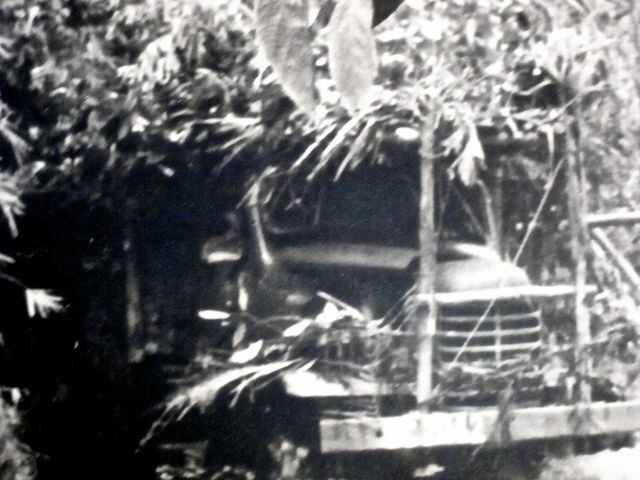 Trucks, tanks, rice, oil and infantry, everything an army needs moved through this trail. The mud makes Flanders look like a desert! I am often baffled by young monster backpackers when I see them in airports with massive sacks on their backs but here, tiny men and women, on foot carrying huge packages of food, ammunition, artillery parts and other supplies, day after day, bombed constantly. Just amazing. Old bicycles, trucks, elephants, oxen, small boats and water buffalo were also used, but at the beginning it was mainly the human back. 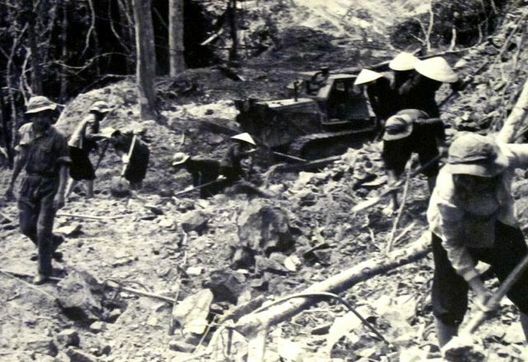 Construction of the Ho Chi Minh Trail. Copyright: aesta1. 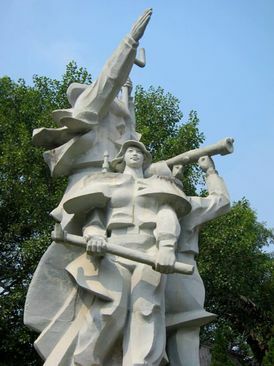 The trail was initially coded Route 559 because of the Military Transport Division (440 young men and women) of that number that was established at the start of the project on May 9, 1959 (Ho Chi Minh's birthday). But it was soon called the Ho Chi Minh Trail by the media and the efforts to block it nearly upset the world in the late 1960’s. It created a route for secure communication for the NLF troops and even later, a very sophisticated electronic network was established using truck based relays. While the sea afforded ease of transport, the American naval blockade made it difficult for the NLF to use the sea to ferry supplies to the South so the trail became the primary choice. 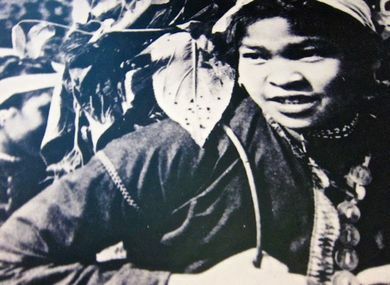 Vietnamese Women and the Ho Chi Minh Trail. Copyright: aesta1. Much of this so called highway began as interweaving footpaths used by villagers to visit other villages and do basic marketing and farming. The trails were narrow footpaths hanging on the sides of hills and along the muddy banks of streams. 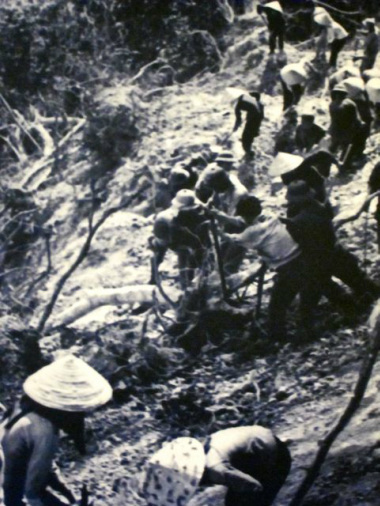 The many volunteers with the Vietnamese army hoed and widened these tiny trails and made them reasonably safe from collapse. They were tied together with hand-made bridges of ropes and bamboo, just strong enough to hold a light tank or artillery piece. About 3000 km of the trail was camouflaged by trellises with naturally growing vines making safe camouflage to hide the troops and supplies from airplane surveillance. The trail in Laos taken from the Museum display. Copyright: aesta1. The 559th Group developed the trail for the delivery of virtually all the supplies and troops needed by a large and very active army supporting Vietnam's southern insurgents. 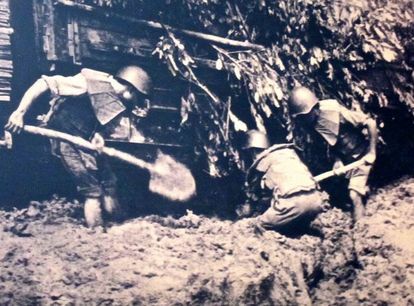 Within each day's walk in the trail were located support units, which the Vietnamese referred to as bihn trams and commo-liason stations (mostly underground) excavated by hand with hidden entrances providing food, guides, ammunition, medical care and accommodation. Tasked with the mission to advance the troops securely, the 559th never stopped developing more intricate and effectively camouflaged highways with bunkers, storage areas, barracks, communication centres, hospitals and command and control centres. A full oil pipeline with pumps and storage tanks was built to deliver the fuel needed by the troop in the south. Rivers also supplemented this system making transport of heavy supplies easier especially in the rainy season. In 1970, the Kong River from Laos to Cambodia became a major thoroughfare. The pathways went through neighbouring Laos and connected to the Sihanouk trail in Cambodia. Lao became the most heavily bombed country in history and the digging out of unexploded ordinance in Lao, Cambodia and parts of Vietnam continues to this day. What a mess. In the early days, it took about 6 months to go down the trail but with improvements, better maintenance and more use, some of the troops from the north of Vietnam could reach the South in about 6 weeks enabling thousands of soldiers to move down. As most of the paths crossed sodden jungles, Malaria was a real issue killing about 10% of the porters and troops. The almost continuous bombing from above took out another untold number. Defoliants to expose the trail to aircraft is still maiming children to this day. Volunteers opened the road in Quang Tri Province (Nov, 1968). Picture taken from the museum display. Rough estimates in 1965 suggest that the trail supported the transport of about 90 tonnes of supplies per day. Materials were convoyed through the trail by relays of porters and trucks unloaded and then reloaded into fresh trucks at each way station. Damaged trucks were replaced from the assets of the way station. This was done day after day until the supplies reached Laos or Cambodia. Then they were placed in water craft or portered to South Vietnam. The PAVN 592nd Pipelaying Regiment also successfully, moved diesel fuel, gasoline, and kerosene through plastic pipelines and small pumping stations,. By 1970, these pipelines transferred about 40,000 tons of fluids per year. Camouflage from the Museum Picture Display. Once the heart of the war and the path to victory, this vital trail has returned to its muddy origins, still providing the very remote rural areas of Vietnam connected pathways as villagers meet the daily needs of today’s life. Many wonder what happened. Invisible aircraft came and went and destroyed everything. Why? Who were they? To have your own taste of this life, drive through the trail here in Vietnam on a motorbike and visit some of the isolated villages such as Ban Hieu along the way. Stay in homes of villagers and move beyond just enjoying the landscapes of rice terraces. Soak yourself in the history of an inspired people and get a sense of what can be achieved by common folks who are determined to win unity for their country. Display of pictures of the development of the trail, ammunition and old transport. Nice garden at the back.